Used AlienBees B800 studio flash. AlienBees B800 self-contained studio flash from Paul C. Buff, Inc. This flash unit is used and may have minor cosmetic marks from previous use, but has been serviced by KHB Photografix and is certified to be in perfect working condition. 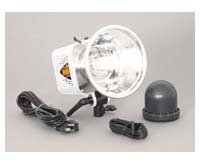 Supplied with instruction manual, new flashtube, new modeling lamp, new reflector, new power cord, new sync cord, new shipping cover, and 6-month warranty. This particular unit has a "Star White" coloured case. If interested in additional units, or other colours, please contact us for availability.